Bakeman, R., & McArthur, D. (1999). Determining the power of multiple regression analyses both with and without repeated measures. 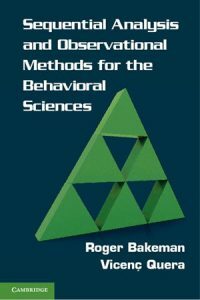 Behavior Research Methods, Instruments, and Computers, 31, 150–154. Bakeman, R., Quera, V., McArthur, D., & Robinson, B. F. (1997). Detecting sequential patterns and determining their reliability with fallible observers. Psychological Methods, 2, 357–370. Bakeman, R., Quera, V., & Gnisci, A.(2009). Observer Agreement for Timed-Event Sequential Data: A Comparison of Time-Based and Event-Based Algorithms. Behavior Research Methods, 41,1379–147. RanSL. This program shuffles lists of items randomly or prepares lists of randomly selected items. Click here to download RanSL.zip. The zip files contain the executables (BWPower.exe, FalliObs.exe, OASTES.exe, and RanSL.exe). The OASTES zip file also contains a PDF file describing the program. These programs were written in Embarcadero® Delphi® XE2 Version 16 Pascal. They run on a PC under Microsoft Windows or a Mac running a PC simulation program.